Dario doesn’t just log and track glucose levels, it charts carb intake, insulin doses, exercise, moods, and more and gives you insights to help understand what may be effecting your blood glucose. 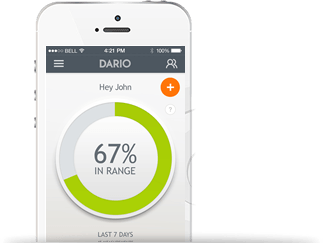 The user-centric design of the Dario app allows logbooks, timelines, and charts to be easily shared with loved ones and healthcare providers. Download the Dario App today and scroll down for more information on how to get started. For questions regarding the set up and use of your Dario Blood Glucose Monitoring System, orders, or other technical support issues, please contact our Customer Service Center at 1-800-895-5921, Monday – Friday, 9AM – 6PM Eastern. For general inquiries about the Dario Blood Glucose Monitoring System, please fill out the form below and a representative will reach out to you. The Dario Blood Glucose Monitoring System combines an all-in-one compact glucose meter that connects directly to your smartphone via the Dario app to provide people with diabetes a simple and accurate way to improve their diabetes management. (*) Note: iPhone7, 7 Plus, 8, 8 Plus, X, Xs, Xs Max, Xr are supported with the product Dario LC Blood Glucose Monitoring System. The information provided is not intended to be used for medical diagnosis or treatment or as a substitute for professional medical advice. Please consult your physician or qualified health provider regarding your condition and appropriate medical treatment. Individual symptoms, situations and circumstances may vary.